Twenty-five miles southeast of Tallahassee there’s a secret buried in the vast Wacissa Swamp that’s one of Florida’s great pioneer legends. For nearly two centuries, stories have been handed-down about the mysterious Wacissa Smoke, which supposedly came from the long, lost Wakulla Volcano. 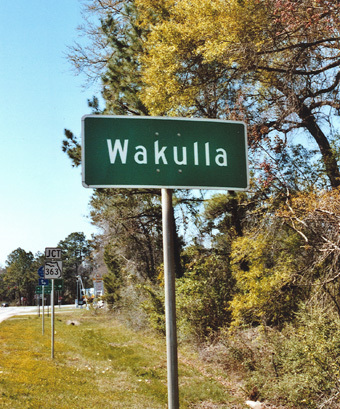 The name “Wakulla” is an early Indian word meaning “mysterious” but the legendary volcano takes its name from the small hamlet of Wakulla, which happens to be in Wakulla County. However, the actual location of this enigmatic volcano is in southwestern Jefferson County, about ten miles inland from the Gulf of Mexico. The first accounts of the Wacissa Smoke can be found in early Seminole Indian lore telling about “smoke rising in the swamp.” In 1830, settlers blamed the mystery on smoke from Indian campfires, or from a pirates’ den. The smoke varied from thick black, like coal smoke, to the bluish-white of wood smoke, and usually swirled upward in a chimney-like manner, although at times it was just a drifting haze. The smoke was visible from far out on the Gulf of Mexico and ships sailing into the port of St. Marks often relied on it as a navigational aid. Seafarers said it was “the old man of the swamp smoking his pipe.” Superstitious folks claimed it was “the Devil stirring his tar kiln.” While each generation came up with a new explanation, the weird smoke continued spiraling up from the swamp. The Wacissa Swamp is virtually an untouched wilderness dotted with numerous sulphur springs. Its subtropical growth covers a marsh that is the habitat to a variety of creatures from snakes as big as your arm to a healthy population of gators. The only dry spots are a few pine hammocks. Many parts of this vine-tangled jungle are as inaccessible today as a century ago, which explains why very few have ever tried to locate the origin of the smoke. By 1840, Tallahassee residents were climbing upon rooftops to see what they thought was smoke from a camp of runaway slaves. On a clear day, the smoke could be seen up to twenty miles and at night people reported seeing a glow way out in the swamp. The Tallahassee Patriot described the glow in an 1880 article as “…looking more like a large fire shooting its flaming tongue high up into the upper realms, frequently reflected back by passing clouds.” During the Civil War, people speculated that the smoke was coming from a camp of deserters or from the mother of all moonshine stills. Each new theory seemed to ignore the fact that the smoke had been observed for at least a hundred years. Then, in 1865, the mystery was given a geological spin when it was theorized that the weird vapor could be coming from an active volcano. In the 1870s, some serious minded folks suggested that there could be a boiling spring in the swamp, or perhaps a geyser that was releasing steam into the atmosphere. But the fiery glow reports from many observers leaned in favor of a genuine volcano. The New York Herald Tribune decided to investigate the situation and an expedition was formed, consisting of a New York journalist and three guides. They fought for nearly three days through saw grass, mud, mosquitoes, and cottonmouth moccasins, but soon gave up their ill-fated quest after one of the guides fell out of a tree while trying to get a bearing on the smoke and the unfortunate New York reporter died from swamp fever. One of the big mysteries is how suddenly the smoke ceased on August 31, 1886, when an earthquake hit Charleston, S.C. sending tremors throughout North Florida. The legend lives on, but the smoke hasn’t been seen since. Did the earthquake cause a geological effect that plugged-up Florida’s volcano? My recent inquiry to the University of Florida geology department brought the following scientific response, “We are unaware of the Wakulla Volcano as described, and certainly no volcanic activity occurred.” But, in recent times, numerous people have accidentally stumbled upon what they believed was the elusive crater. One old timer described seeing “a blackened, dishpan-size hole atop a rocky knoll which was scattered with rocks.” Others, including William Wyatt in 1935, have claimed to find “scattered rocks that looked like they had been burnt by extreme heat.” In the 1940s, an oil company drilling a test well near Wakulla, brought up volcanic material, but it came from 7000 feet below the surface. When highway 98 was being built in 1949, workers came upon a deep hole in the middle of the Wicissa Swamp that required 34 dump trucks hauling 600 tons of rock to fill. Was that the crater? 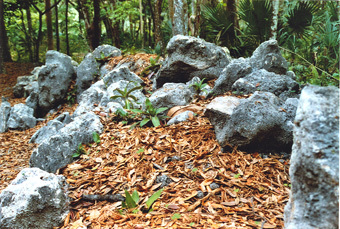 Prior to 1960, Clarence Simpkins of the Florida Geological Survey, made several expeditions into the swamp and discovered boulders scattered in piles “like they had been thrown out of the earth.” Simpkins also stated that these were not of volcanic origin. Over the years people have offered numerous explanations for the mysterious smoke; everything from burning peat bogs to underground cavern fires to moonshine stills, but the swamp isn’t willing to give up its secret. Somewhere out among the gators and snakes lies the answer to Florida’s lost volcano mystery, perhaps waiting to become active again. The Stories on this site are just the tip of the iceberg. 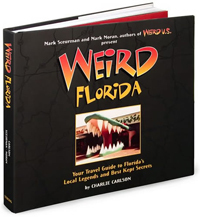 Buy Weird Florida today!